Below are some photos of a box that I am using for my travel paint storage box. I took a small piece of wood, cut 2 slits in it and then glued it to the bottom and side of the metal container. The surface where the paint is on is plexiglass. It is ok for storage, but ideally you would want to use glass. I didn't have any glass and really didn't want the added weight as I take this with me to a hotel where I sell to the tourists here. The duct tape is put on the plexiglass to keep it snug in the wood block and to give me a defined place to grab when taking the paint in and out. You can see that I organized the colors in different but similar colors. If I am working on skin, then I have all the skin tones that I could need, on one palette etc. When done with the painting, the lid is put on to keep the paints clean. They will never dry out, but they will get dirty. This tin box I believe was an old container for some Christmas cookies. Find something similar with a lid and be inventive! Below are a few more pictures of storage and palettes. The first being a palette I had that was perfect for me to paint this wonderful photo. Someone else's art that I found online that I loved and wanted to try to do. I did do it, on a homemade canvas - it turned out great and is hanging in my studio... can't sell or anything, just a learning exercise as I loved the painting. 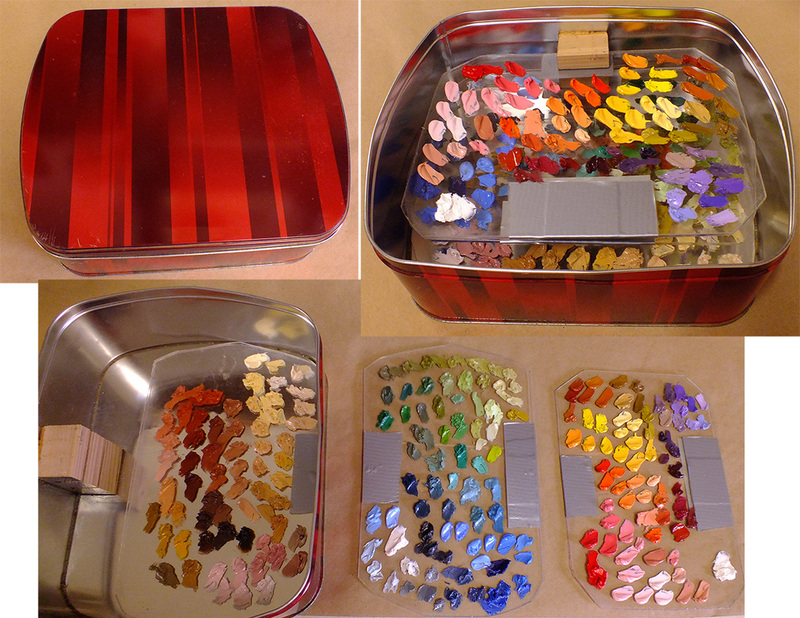 The 2nd and 3rd photos are of the first box I made to store my paints in and a photo of my brushes. I show them because you need to know that almost all of them have paint on them and it doesn't matter as the paints don't dry. Actually better on your brushes because you aren't cleaning them all the time! Once my palettes get messy, I will sit down and clean them up pulling out the cleanest colors first and transfer them to a new palette, and then make new colors by mixing those left. Fun to see what colors I can come up with! Never throw anything away! NO - ZIP - NADA waste! Love Genesis!!! !